Tremors were felt across campus on December 7, 2013. Mainly felt from the higher floors of buildings, these tremors were caused by an earthquake that originated approximately 30 miles north-northeast of Oklahoma City. This was many people’s first experience with earthquakes. Individuals may have been unsure what to think, uncertain whether it truly was an earthquake or not. However, this sort of thing is not new to the region of Oklahoma by any means. Oklahoma has had its fair share of earthquakes since the early 20th century. The first recorded earthquake to have centered in Oklahoma occurred in September of 1918 and was located in El Reno. During this magnitude 5 earthquake, objects were thrown from shelves. Aftershocks were also felt the next day. On December 27, 1929, another earthquake centered in El Reno was felt across the state. This earthquake happened to be a magnitude 6, and reportedly caused chimneys to fall onto houses. Earthquakes were not felt again until 1959, but this would prove to be quite a year for the natural phenomenons. On April 9, 1952, a magnitude 7 struck Oklahoma and was felt across all neighboring states. This earthquake, also centered in El Reno, caused chimneys to fall as well as bricks to loosen from buildings. Tile was also broken on many walls and floors. Aftershocks were felt in the following months of this earthquake, however these caused minimal damage. Earthquakes occurred throughout the remaining decades of the century, as well as the early 21st century. However, these did not cause as many damages as the 1952 earthquake. One question has yet to be answered though, why does Oklahoma seem to have so many earthquakes? The cause of earthquakes is the grinding and shifting of fault lines in the earth’s crust. When these faults slip, they cause an earthquake. 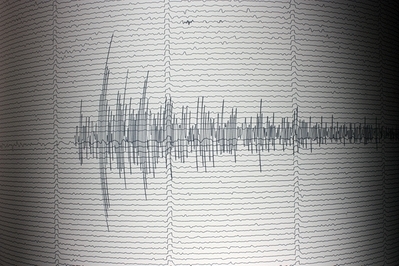 The measuring device for an earthquake is a seismograph (pictured). The Nemaha fault line seems to be the culprit for the earthquakes that are caused in Oklahoma. This fault runs right through Oklahoma City and runs into I-40 and I-35 where they intersect each other. Chances are strong that you have driven over this fault and not even known it. A large fault, like the Nemaha fault, can have smaller faults running off the main fault in different directions. These smaller faults can slip and cause smaller, less harmful earthquakes than if the main fault were to give in. It is unlikely the Nemaha fault will slip in the coming years, however it is not impossible. Even if a huge earthquake may not be in the near future, smaller earthquakes may occur every so often throughout the area. These earthquakes seem to be a part of life in Oklahoma and they will not go away soon.